USAF F-15 Strike Eagle, 325 FW, Tyndall AFB. A repaint of Nathan Fife's F15 Strike Eagle. The United States Air Force selected McDonnell Douglas' design in 1967 to meet the service's need for a dedicated air superiority fighter. The Eagle first flew in July 1972, and entered service in 1976. The F-15 is expected to be in service with the U. S. Air Force until 2025. This F-15 83-020 is a member of The 325th Fighter Wing based at Tyndall AFB and is painted in a low visibility tactical gray. Included is the F-15 panel by Chuck Dome with updates by Bob Chicilo. Textures and updated flight dynamics by Mark Rooks of RDG Aircraft. Includes pictures and history of the 325 th FW and the F-15 Eagle. By Mark Rooks. USAF F-15 Strike Eagle in flight. F-15 Tyndall AFB 325 ..... Support a Mercy Flight near you. Francis Silva Does not belong to RDG any longer . He does not have the right to RDG aircraft or aircraft files created by Mark Rooks and does not have the authority to give permission to use RDG aircraft or aircraft files created by Mark Rooks . I apologize if some of RDG aircraft download numbers look fraudulent . This is the work of one individual . This individual has been ask to stop and as of yet has not . 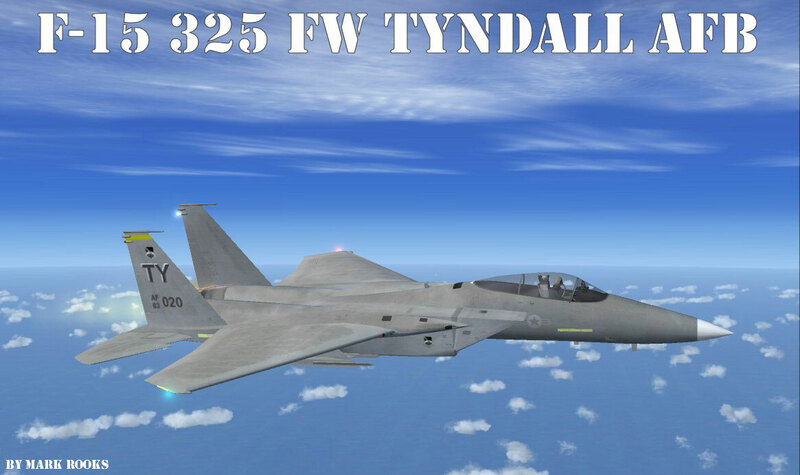 2.Copy the " F-15 Tyndall AFB 325 " and paste it in the main aircraft folder. 4. Unzip the gauges folder by Bob Chicilo and follow the instructions. The archive f-15325thfwtyndallafb_fsx.zip has 10 files and directories contained within it.